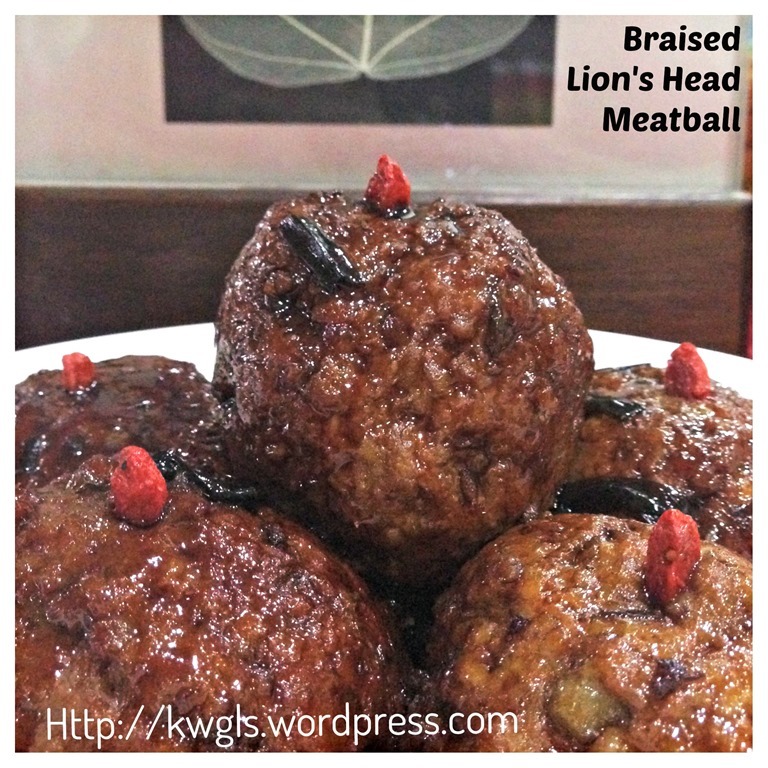 Though lionhead’s meatball have a standard size of about 5 cm diameter of 100 grams each, however, I think my last illustration may not be attractive to local readers as they may found the meatball is excessively big.. Since I have prepared this for lunch, I have decided to prepare smaller about 3 cm in diameter. In addition, in order to enhance better handling and firmer texture, i have added some stale bread to the meat mixture. One reader is asking how to obtain the firm meatball. One way is after the first shaping, throw the meatball to the table to force the air out and reshape again. 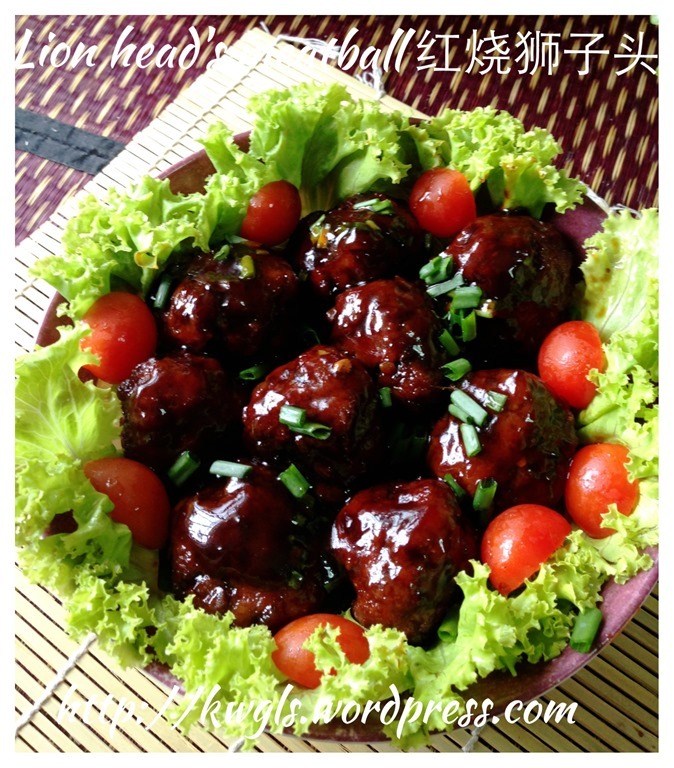 You can also use pan frying the meatball before braising instead of deep frying. All changes are highlighted in red colour wordings. 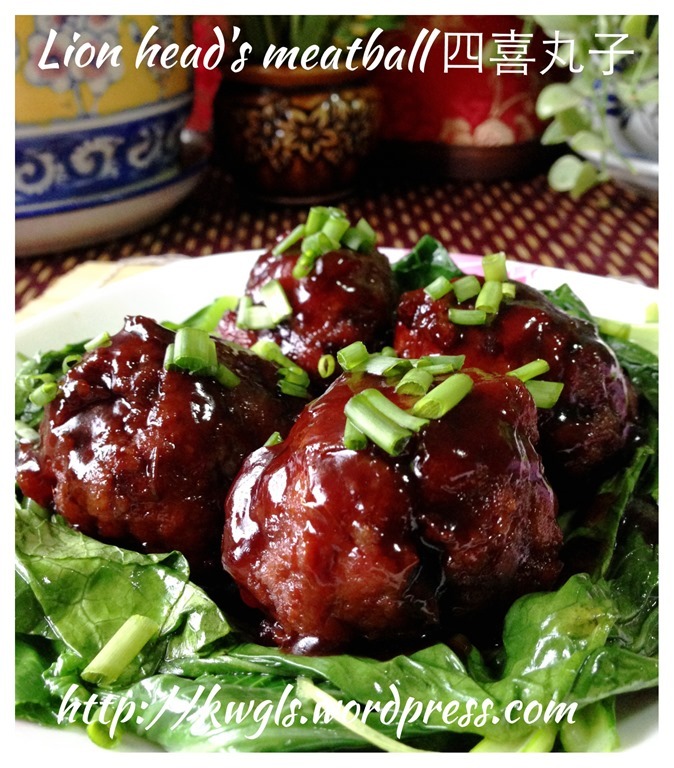 When I was stationed in Shanghai about 15 years ago, I am especially happy if my clients ordered the famous Lion’s Head Meatball. 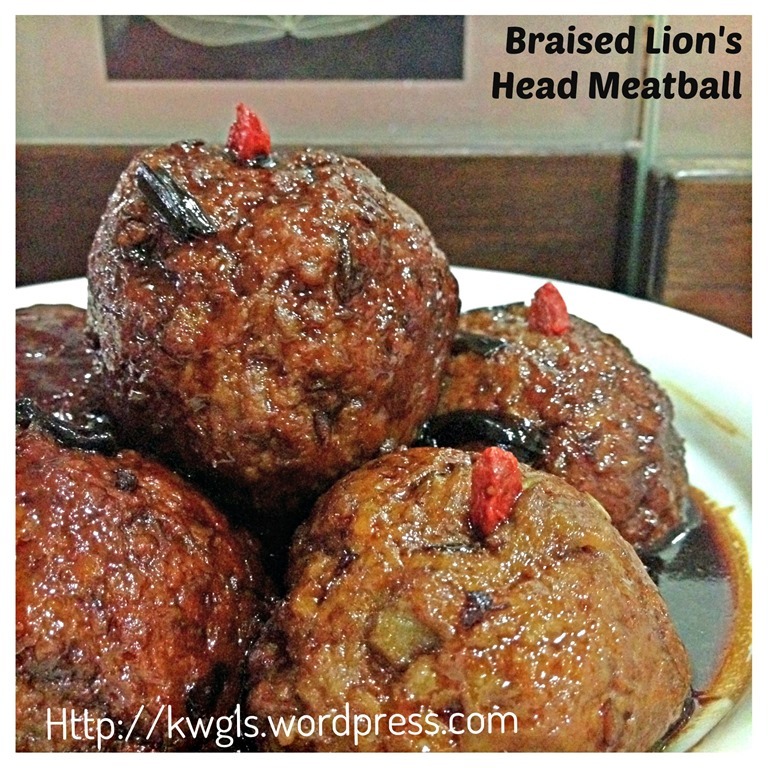 I like it because the meatballs were soft but firm and a blend of sweet and savoury meat balls. 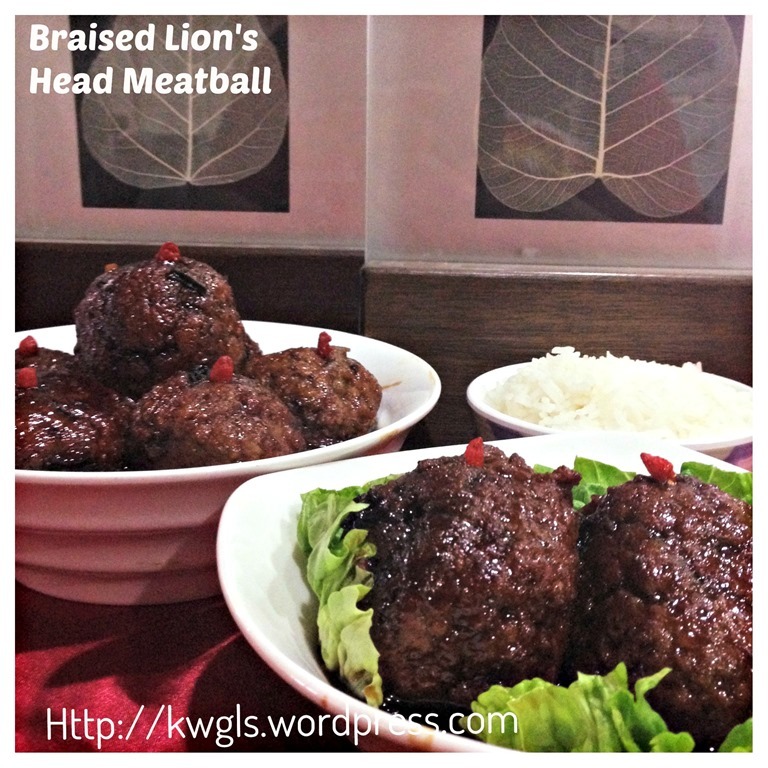 I am especially impressed by the size of the meatballs which was usually about 5cm in the diameter and we never cooked meatball of this size in my house not even near to this size. 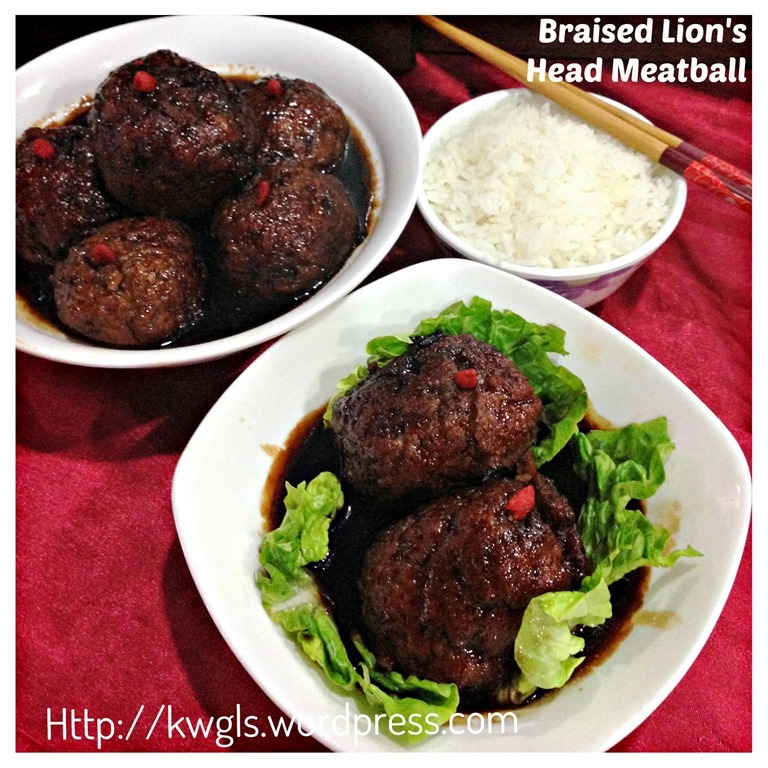 There are two version of the lion’s head meatball, once is the braised darker version whereas another type is the clearer soup version. 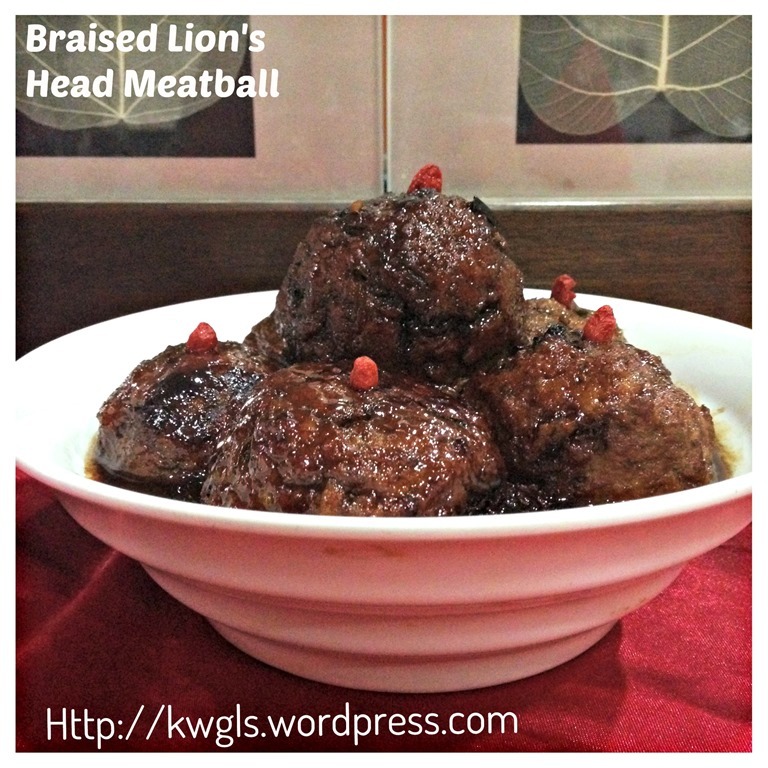 In this post, I have prepared the dark sweet version of the meatball because it was the type that I missed dearly. As this is a savoury dish, all quantities stated here are for reference and please feel free to adjust to the taste that suits your families taste buds. I have purposely prepared in the traditional size of about 5 cm in diameter with about 100 grams each. However, if this is too big for you, feel free to the adjust to the size that you feel comfortable with. 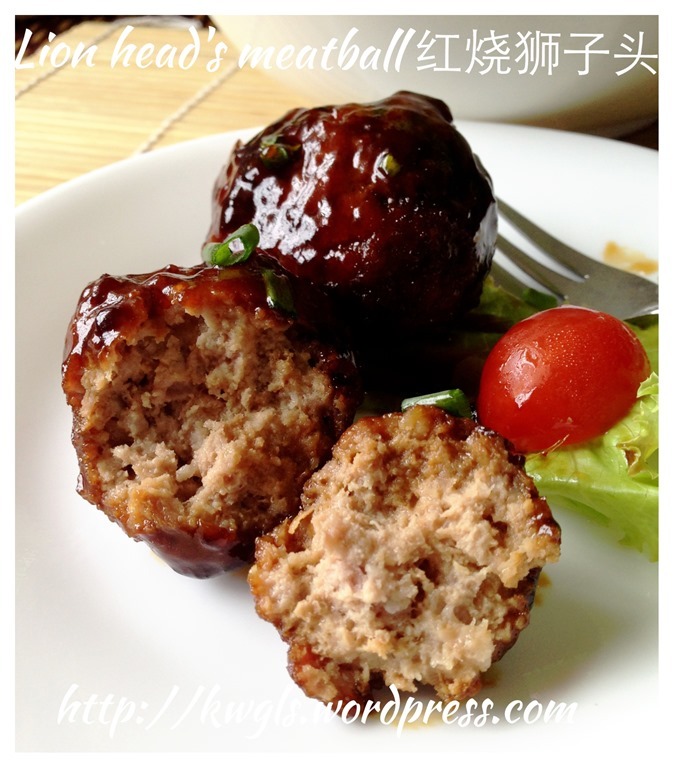 The meatballs are supposed to be slightly hard on the exterior but soft and juicy in the interior. 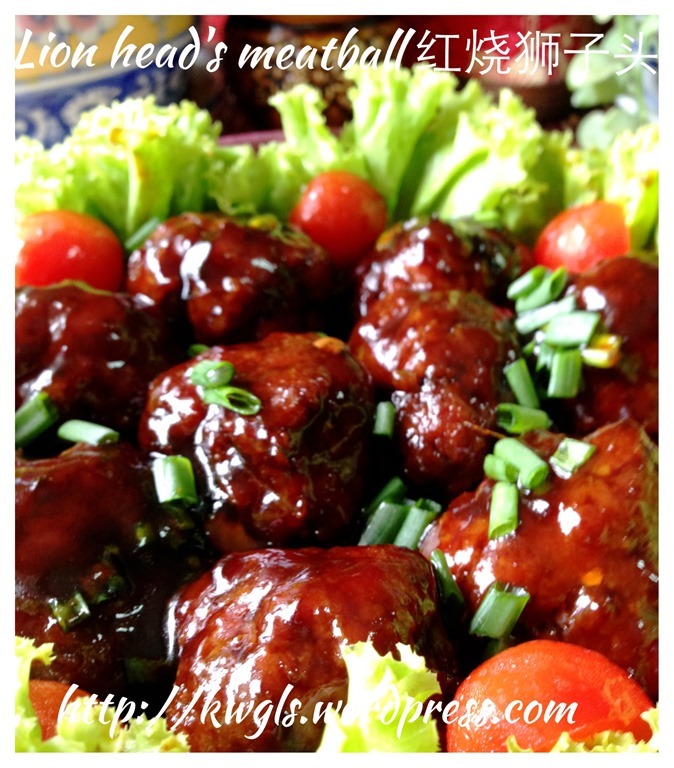 It goes well with the braised sauce which is sweet with soya sauce aroma. The sauce is especially tasty and goes well with some porridges or white rice. 30 grams of stale bread or mantou cut into small pieces..
As this is a savoury dish, all condiments and seasonings are for reference and feel free to adjust to the quantities of seasonings that suit your taste buds. Pound the ginger and garlic and extract the juice. Set aside for later use. In a food processor, put the water chestnuts or lotus root and white portion of the spring onion, blend until small pieces. 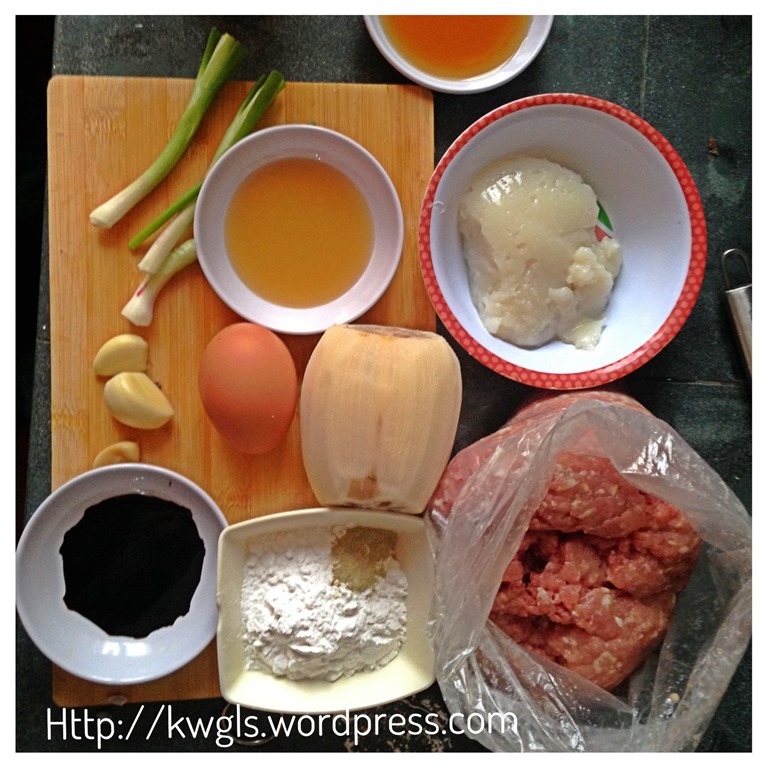 Add the minced meat and all other ingredients (including eggs, sugar, ginger and garlic juices and seasonings), blend until fine. Alternatively, you can manually mix these ingredients. 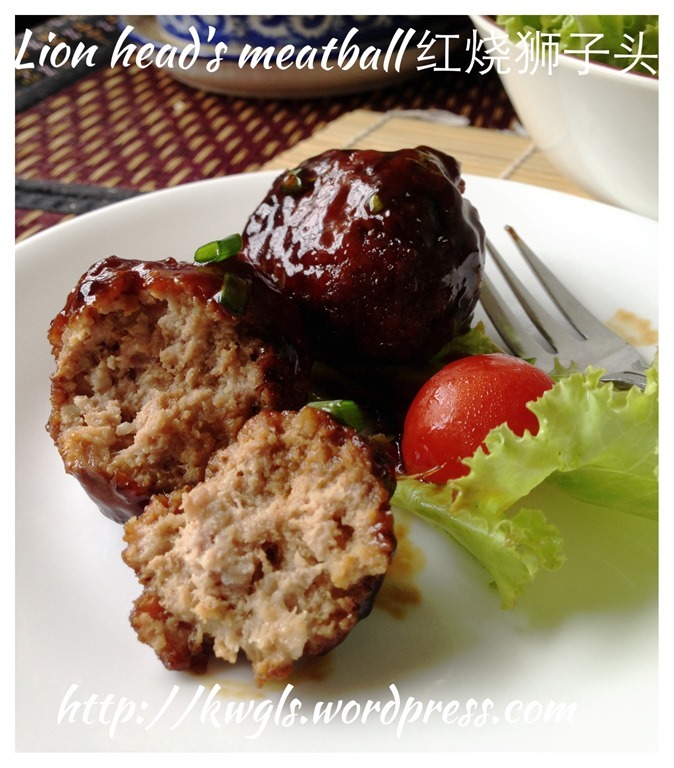 Shape the minced meat into round balls of your desired size. (I have shaped the balls into abut 5cm diameter round balls of about 100 grams each). 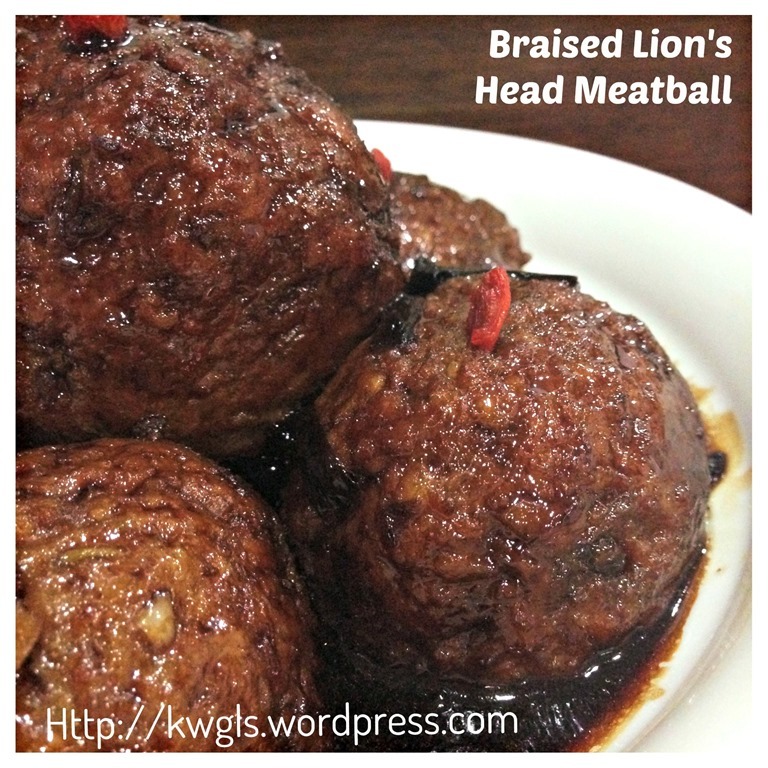 In order to force the air out, throw the meatball on the table and reshape again. 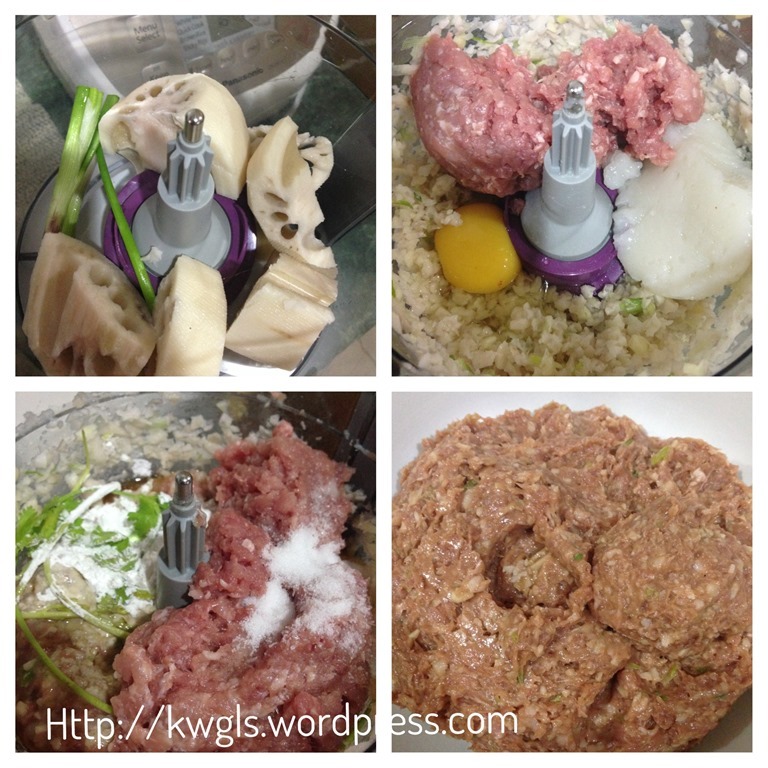 Purpose of this step to ensure some springy meatball. Set aside for later deep frying. In a pot, put the 2 cups of water and all the seasonings (except the starch solution) for the braising (this is an estimate and will depend on the size of your pot. In general, the water should be able to cover at least 3/4 height of the meatballs. Therefore, you will need to readjust the water and seasonings if necessary for the later stage). Bring to boil. In another frying pan, add some cooking oil for deep frying. Test the readiness of the cooking oil by inserting a chopstick into the cooking oil and see if bubbles starts to emit. 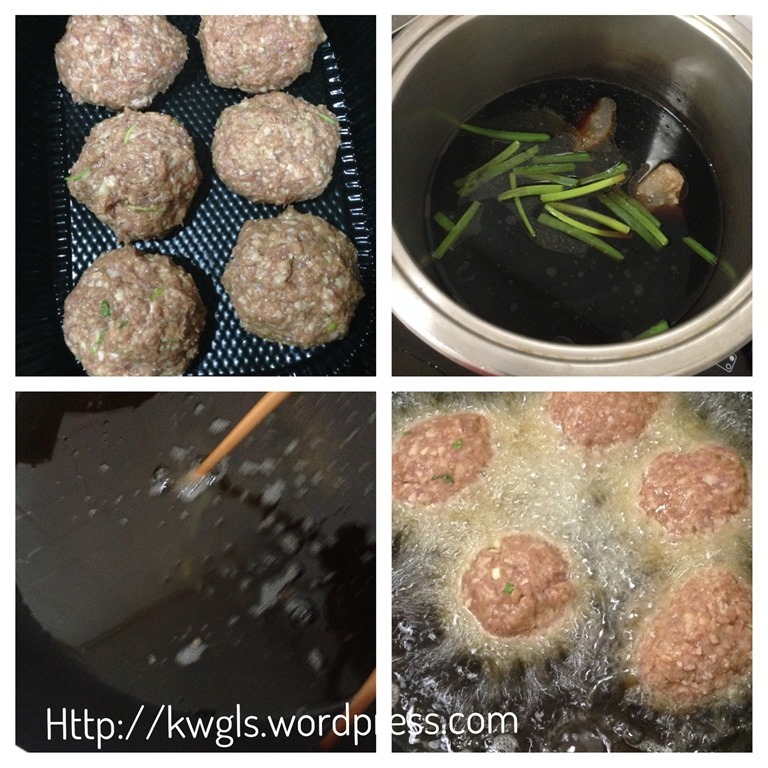 Once the oil temperature is ready, put the meat ball and deep fried until the outside is golden brown. 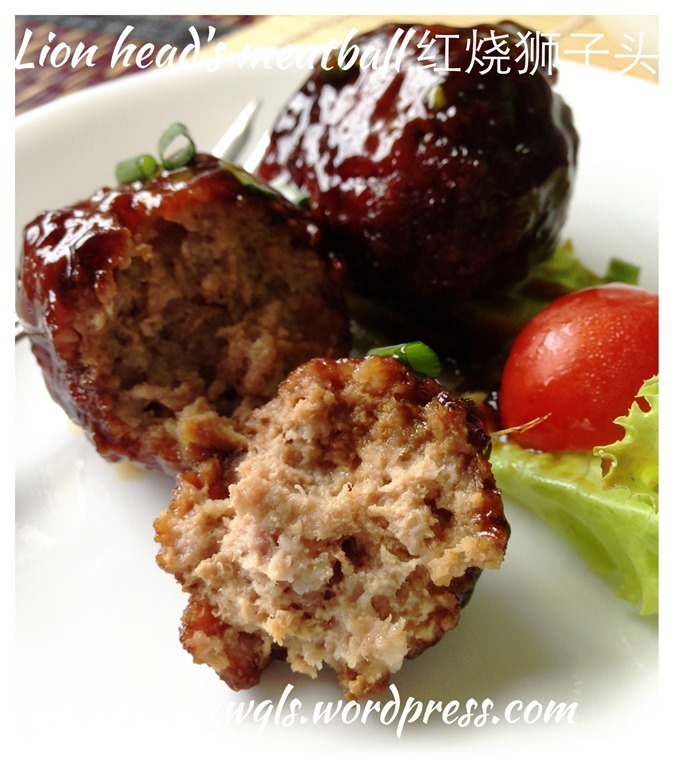 (Note that in this step, the deep frying is to fix the shape of the meatballs and not really to cook the meat ball. 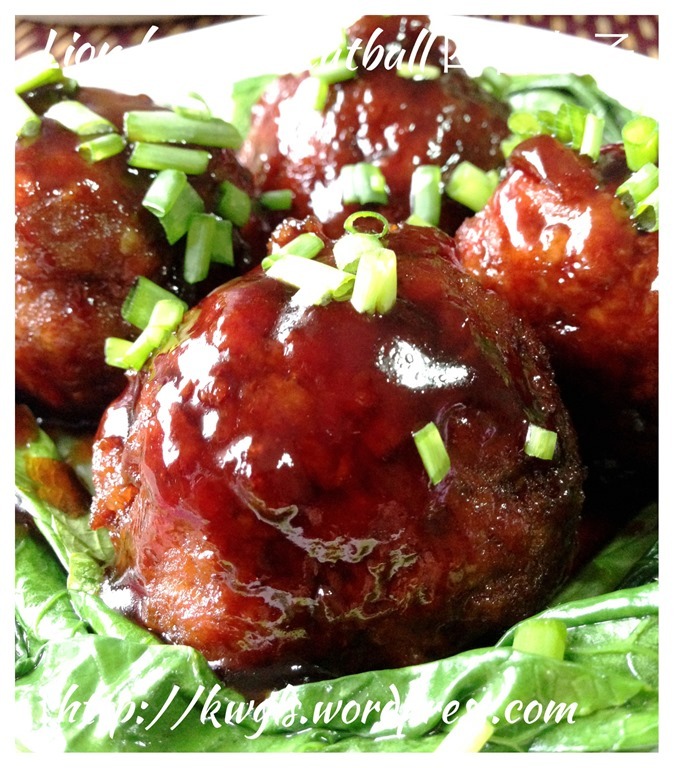 You can use an air fryer if you prefer.) Alternatively, you can shallow frying or pan frying the meat ball. As long as the exterior has hardened, it is ready for braising. 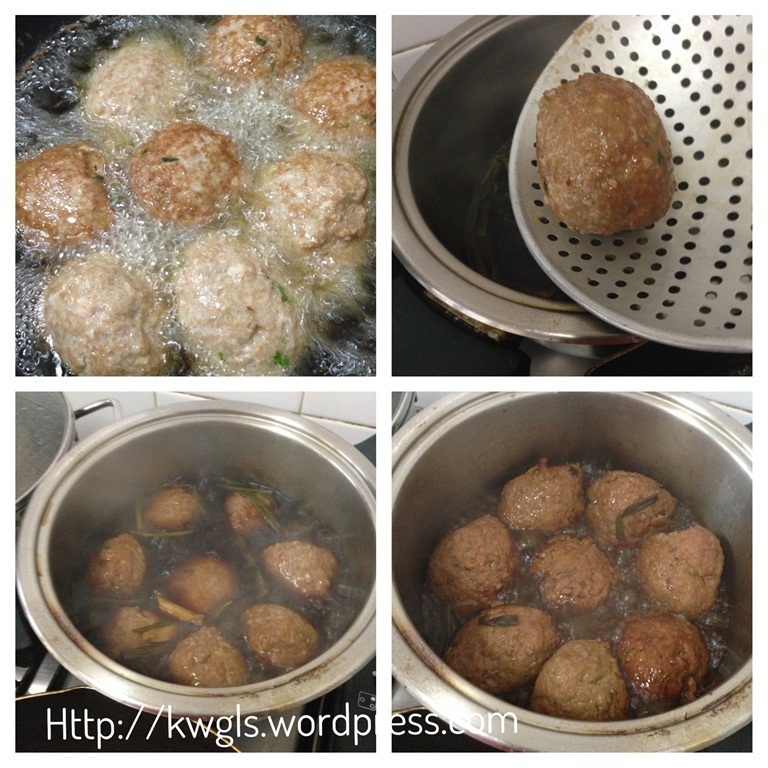 Once the meatballs turn golden brownish (about 5-10 minutes), transfer the meat ball into the hot boiling sauce on the other pot. Let it simmer at medium heat for about 10-15 minutes. Add additional water if the sauce dries up to quickly. After 15 minutes, add the starch solution and off the heat when the sauce turns transparent (about 1-2 minutes). Best garnish with blanched vegetable of your choice and serve as one of the dish in a typical Chinese set meals. 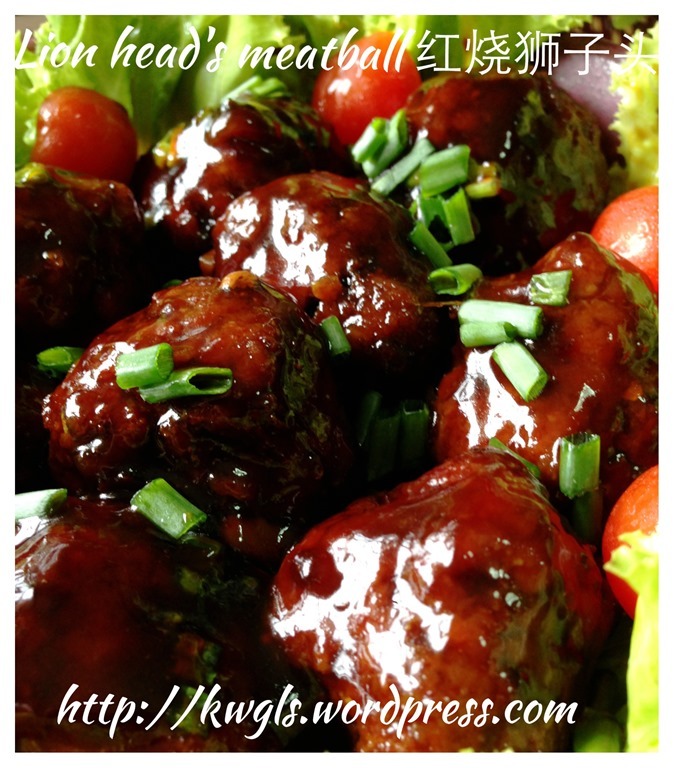 The normal size of the meatball is about 5-6 cm in diameter with about 100 grams each but recently, most families and restaurant have reduced the size of the meatball due to health conscious and the unwillingness to take too much meat. Therefore, feel free to reduce to the size of your choice. It was usually served 4 in a plate surrounded by blanched or braised vegetables such as cabbages. 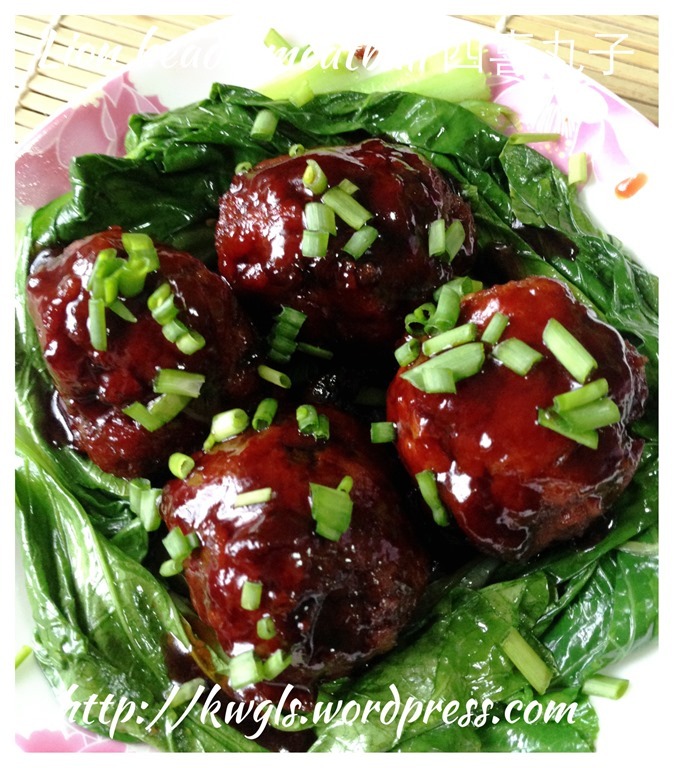 This is called Four happiness meatballs (sixiwanzhi or 四喜丸子) especially in the Northern part of People’s Republic of China. 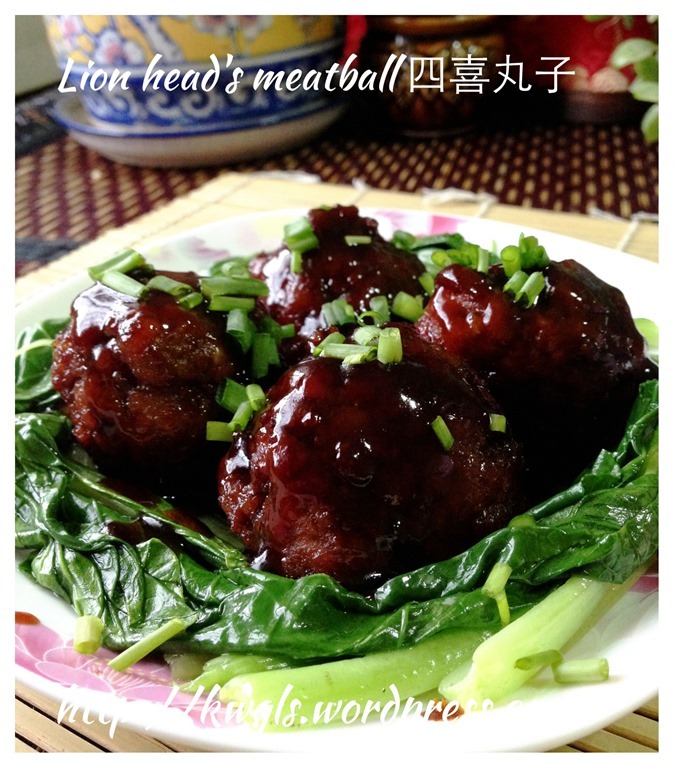 This entry was posted in Dish, Food Preparation Series, Meat Dishes and tagged 8, 红烧狮子头，狮子头，Lion's Head Meatball, GUAI SHU SHU, Guaishushu, kenneth goh, Lionhead Meatball, Lionheads, postaday. Bookmark the permalink.